CBC News’ publisher John Cruikshank took issue with the Conservative Party’s letter to its members outlining the latest CBC controversy. I’ve reproduced Cruikshank’s letter below and offer my own responses to this senior manager at CBC in between paragraphs. I have reviewed your pre-Christmas fundraising letter. The underlying issue here is the potential damage done to Canadians’ faith in the public broadcaster’s ability to deliver a non-partial news report and to remove itself from the political process. Your statement is akin to blaming the victim. The political process? Again, allegations of conspiratorial parliamentary committee manipulation between the Liberals and the CBC are so egregious because the questions went far outside of the mandate of the committee and if the allegations of collusion are true – it goes without saying – they extend beyond the mandate of the CBC. I understand that a private association like the Conservative party does not have the sort of transparent and reliable complaints process that we have at the CBC. That is regrettable. You say “private” like it’s a bad thing. Besides, it is not the transparency and accountability of the Conservative Party that is in the spotlight here. Again, it is that of the CBC. I understand that you have already availed yourself of access to our Ombudsman, complaining that a member of the CBC News staff communicated suggested questions to Liberal MPs in advance of a public hearing. I appreciate this show of confidence in the integrity of our process. I wish you had reflected that respect for our commitment to answer any and all complaints about our work in your unfortunate letter to potential donors. This isn’t so much a show of confidence in the process but rather an indication of the limited number of avenues of accountability that the Conservatives can seek of the institution. The only method by which one can cry “foul” to the material reported by the CBC is to write to an ombudsman. We cannot use our remotes or our wallets to demand accountability as the CBC receives $1 Billion in tax revenue every year from the government. Even the government is elected; it is directly accountable to the voter via the electoral process. CBC directors are not popularly elected and they may not even represent the Canadian reality. As a private institution, the Conservative Party is accountable to Canadians. The party cannot operate without donations from Canadians and we gave the party our confidence to the tune of $18.9 million in 2006 (2007 annual figure not yet available). One wonders of the extent of the sum that the CBC could raise (even without $1100 donation caps) if it faced the direct accountability of Canadians via the market. You were well aware when you sat down to write your appeal for cash that CBC News had publicly condemned the behaviour you complain of and had called a disciplinary meeting to look into it. An appeal for change and for action should neither be dismissed nor diminished because of the process underway. The Conservative Party seems to seek preventative action rather than put its faith in process that only comes about when malpractices (alleged or not) come to light. Your suggestion to your potential contributors that the CBC was waging a partisan campaign against your party and the government of Canada was flatly contradicted by every step we had taken before you composed your cash appeal. Again, it is the initial allegations of journalistic malpractice that likely concerns the Conservative Party. You are arguing that since there is now an internal investigation (again, only after the fact), that this dispels the cloud. It is absurd to say that an investigation of alleged partisanship itself disproves partisanship. We accept that you are not the only, or even the first, Canadian political party to use CBC News as a whipping boy for fundraising purposes. The Liberal party accused us of bias on several occasions when it fit their agenda. By this argument you suggest that the CBC isn’t non-partisan but rather that it is bi-partisan. The Ombudsman that seems to be the most hopeful lever of accountability has recently concluded on CBC missteps towards the Conservatives. The Liberal Party may have accused the CBC of skewed reporting, but the ombudsman has convicted the CBC of it following conservative concerns. As a public broadcaster we take our responsibilities to all Canadian shareholders very seriously. This is more than just a glib promise. Hey John, where can I sell my shares? Unlike any other broadcaster in the country, the CBC has a journalistic standards and practices book. This book is given to each reporter, producer, editor and host working at the CBC. It outlines in explicit detail the code of conduct for our journalists. It covers conflict of interest; it covers issues of journalistic fairness and balance. It is clear, and it is binding. It is also a living document. We talk about it and refer to it daily when we are dealing with difficult ethical issues. It is also freely available to the general public to see, so they know exactly what standards we aim to maintain. I would be delighted to share a copy of it with you. Here, the PC reference isn’t simply offered by you as trivia, you suggest some introspection for the Conservatives as if the Conservatives behaviour is inconsistent by your implying that both entities are the same. Yet this controversy started by alleged manipulation of a Parliamentary committee by the CBC outside of the committee’s mandate as the Liberals (via the CBC, allegedly) tried to tie Harper to Mulroney. While all our journalists try to live by our code of conduct, CBC News is not infallible. But we are accountable. When there are errors of judgment, or misunderstandings or improper interpretation of the journalistic standards and practices, we investigate. When we discover shortcomings, we change our standards and practices. No other news organization in the country operates within such a demanding ethical regime. For you to sully the reputations of so many dedicated Canadian professionals is utterly unacceptable. Your denigration of our ethical standards can only contribute to the public cynicism about public life that is already far too pervasive. I take issue with your circling of the reputational wagons of hundreds of so many Canadian professionals around an institution which may have serious faults to address. There are good, capable and professional people that contribute to reporting for the CBC and they should not be your shield. Further, the Conservatives are not denigrating the Corporation’s ethical standards, they are concerned about staff that may fail to meet set standards and managers and directors that fail to enforce them and/or meet such standards themselves. As we break for the Christmas/New Years holidays, Ottawa has been talking about a real possibility of an election in February and March. I believe that the current conventional wisdom on the timing of an election is wrong. First, no party is really in a good position for an election. Consider the Conservatives; statistically tied with the Liberals in the latest Harris/Decima poll, the Tories aren’t riding their traditional high numbers. Some have attributed this decline to Canada’s bad press at Bali, some blame the attention that Mulroney has received. But a budget will be a bonanza of tax cuts in February, you may think, and this surely will be enough to buoy Conservative numbers. It may, but the Conservatives need the decision of at least one party to survive and three to defeat it. That brings us to the main opposition party: the Liberals. Stephane Dion has been routinely embarrassed in the House of Commons by being forced to abstain from votes of confidence such as the throne speech and subsequent crime legislation (named a matter confidence by the PM). A staffer in Dion’s office recently told me that this pattern cannot continue at length. He’s right. The Liberals will stand in February to defeat the budget. In fact, they’ve already indicated that they intend to try force an election. This is a necessary move by Dion, as he cannot remain neutered indefinitely lest his caucus revolts. The smart play here is that he’s been first out of the gate in declaring his intentions meaning that he will not have to race Jack Layton and Gilles Duceppe to the waiting cameras outside of the House doors (besides Layton and Duceppe are closer to the doors anyway). So Dion is forcing the NDP and Bloc to react to Dion whereas earlier Dion reacted to the declared intentions of those two parties instead. Dion is well ahead on this vote. This will help relieve some of the negative attention received from his chronic abstentions in this latest session in 2007. The move, however, is somewhat disingenuous as Dion knows that at least one other party will save Harper’s government (and Dion) to fight another day. While the NDP has had better fundraising fortunes than the Liberals, this opposition party still needs to continue its strides in becoming a viable opposition in the minds of Canadians. While they will no doubt vote against the budget (and the Conservative government won’t change its legislation to accommodate them), they are unlikely thrilled about a March election. Further, the NDP standing with the Conservatives on a conservative budget would destroy much of the NDP’s credibility. That leaves us with the Bloc, who shares a particularly important electoral interest with Stephen Harper: Quebec. The Bloc will vote for the budget because there will undoubtedly be some good items for their province. In fact, we can be quite confident in this prediction as Harper/Flaherty would be unlikely to pen a budget without extended consideration for Quebec. If they did, they would guarantee that their government would fall and that their hard-fought gains in that province would be tenuous at best and their planned gains would evaporate overnight. Expect good things for Quebec in 2008 and expect the Bloc to pass the budget; the Bloc is the only party Harper needs onside to survive. This scenario generally satisfies all parties to some extent. The Conservatives will continue to govern while entrenching their image as tax fighters in the minds of Canadians. They will also continue to build in Quebec. The Liberals (and especially Dion) will relieve a lot of pressure internally in caucus and externally in their image as the hapless leader breaks his abstention streak. The NDP will still get to stand up to the Conservatives (the NDP gains from this scenario are the least of the four parties). Finally, the Bloc will have voted for a better budget for the people of Quebec, even if it is delivered by Conservatives. The Bloc has been concerned by the Conservative encroachment upon their nationalist strategy as it has been reconfigured by Harper as decentralization and respect for provincial jurisdiction. Duceppe would only be handing Harper voters if he defeats this government as the Prime Minister will be seen to be a better defender of Quebec’s interests. If the Prime Minister really wants an election in March, the budget will contain a poisoned pill that is inert to Quebeckers but unacceptable for the Bloc. OTTAWA – The Liberal Party of Canada must reveal the scope of the party’s alleged collusion with the Canadian Broadcasting Corporation (CBC) on House of Commons committee business, and explain the party’s denials of collusion given contradictory statements from senior members of the Parliamentary Press Gallery and the CBC itself. According to former Liberal Cabinet Minister Jean Lapierre, now a political reporter with the TVA network questions asked by Liberal members of the House ethics committee on December 13th were “written by the CBC” (CTV Newsnet, December 13, 2007). CTV’s Mike Duffy later added that Liberal researcher Jay Ephard admitted that the CBC and Liberals worked together on the Liberals’ committee questions (Mike Duffy Live, December 13, 2007). And now, according to Canadian Press, the CBC has launched its own internal investigation into what it described as “inappropriate” practices (Canadian Press, December 14, 2007). Yet the Liberal Party’s has denied that there was collusion between his party and the CBC and called the allegations a “total fabrication” (National Post, December 15, 2007). While Conservatives welcomed the launch of an internal CBC investigation into the alleged Liberal-CBC collusion, the party remains concerned about a disturbing pattern of anti-Conservative bias from the public broadcaster. During the 2004 election, the network was caught soliciting anti-Conservative participants for a town hall-style meeting. And the network admitted “regret” in 2006 after airing a report that negatively portrayed Stephen Harper by using out-of-context footage. Some people have been saying, “but reporters suggest questions with committees all the time”. The most striking problem with this instance is that the questions under Conservative complaint here are questions that go beyond the scope of the committee’s scope, which is actually defined as: “Study of the Mulroney Airbus Settlement”. Suddenly questions about Maxime Bernier and the wireless spectrum auction came up. The Prime Minister instructed his caucus to put a freeze on communications with Mulroney so that the opposition could not suggest or imply that the former Prime Minister, who continues to be under fire, is linked to the current crop of Conservatives. It is interesting that it was not the opposition that was the genesis of the attempt to link Mulroney to Harper, but allegedly it was the CBC. The Liberals, however, are ultimately to blame if this report of “collusion” is true. That party and their MP Pablo Rodriguez were the ones to channel the CBC’s request(s) into the committee. To the CBC (and the reporter following the wireless spectrum story), the sole opportunity to question the former Prime Minister may have proved too tempting to pass up, even if it meant inappropriate influence of a committee far beyond “the airbus settlement” to “Mulroney and everything Conservative”. Conservative committee members termed Rodriguez’s line of questioning as “a fishing expedition”. The Chair (also a Liberal) was quite liberal himself in his ruling in allowing the unrelated questions to continue. What is the extent of influence of the CBC on the Liberal Party? How high does Trudeau’s party jump when the public broadcaster tells it to? Frankly, this wouldn’t be a scandal in the eyes of the CPC if the Liberals had laughed at the CBC’s request/demand and had proceeded by staying within the mandate of the parliamentary committee on access to information, privacy and ethics. The Liberals were ultimately the precipitators of this scandal by showing that they could be influenced to brutally stretch the committee’s scope. It is also troubling to know that the CBC itself is party to the political process on the Hill. Mike Duffy commentator Jean Lapierre makes allegation that CBC wrote questions for the Liberals on the wireless spectrum auction. John Tory is in Ottawa tomorrow to meet with members of the Ontario CPC caucus and key federal Conservative strategists. Of course, the PCPO leader comes to the nation’s capital under the cloud of a challenge of a possible leadership review being organized by conservative strategist Nick Kouvlalis, who is leading the charge for a review with his “yes” campaign. The leader of the “no” (to review) campaign is John Capobianco, a long-time conservative organizer in his own right. After interviewing Kouvalis on his efforts last week, I immediately sought to ask Capobianco a set of questions about the possible leadership review and his team’s efforts to shield Tory and promote him as a strong leader for the party membership. on the phone, which is about as ‘grassroots’ and genuine as one can get. their concerns and, more importantly, learning from them. JC: It’s true that John Tory set high standards for himself, and didn’t achieve what he wanted to, he knows and laments this. However within weeks of the election, he was out in the ridings, face to face with the party and working with them to discover what he did wrong, which shows he is indeed a leader. Tory should stay on because his drive and energy to create a compelling conservative vision for the province is relentless. Out of nowhere he almost became mayor of Toronto, and within three years of winning the leadership of the PC party – at a time, I will add, where we were $10 million in debt and with the lowest morale I’ve seen in years – many thought we were in a position to win the province, despite an economy that appeared strong and huge liberal spending. When you talk to party members, of course they’re upset at the loss; we as Conservatives have certainly suffered our fair share of losses both provincially and nationally over the years, but we usually determine where we made our mistakes and went about fixing them… we don’t and should not get into the practice of defeating our leaders after one election loss. If we did, we wouldn’t have had Mike Harris as Premier or Stephen Harper as our current Prime Minister, both suffered initial electoral defeat, but come back to win their respective elections the second time. Tory is currently listening to and working with the party and over the next 4 years will create an incredibly dynamic Progressive Conservative Party. JC: Tory will be doing what he has been doing since October, meeting with the party, face to face and in the open, learning and letting progressive conservatives across the province know that they can trust him to be a strong Conservative leader. Much is being made of Tory’s tour to connect with the membership for feedback and for a post-mortem to the election loss. Critics on both sides of the debate argue about the merits of how these consultations are being held. Tory’s people would seem to claim that these consultations show a grassroots effort to consult the membership, while the “yes” campaign suggests that the consultations are framed by Tory and show little accountability. Capobianco seems to counter the self-proclaimed label of “grassroots” by the “yes” campaign by suggesting that the campaign is being organized by a handful of senior conservatives. Federalist tide in Quebec shifting Conservative? Two former federal Liberals in Quebec were to do battle for the Conservative Party nomination in Laval-Les Îles but one dropped out an hour prior to the contest. In the end, Agop T. Evereklian, a former chief of staff to a Liberal cabinet minister won the nomination against another challenger. Stating that his conversion to Conservatism was a recent occurrence, Mr. Evereklian explained that he saw no possibility of advancement within Liberal ranks, “under the present circumstances.” I appreciate Mr. Harper’s leadership, he keeps his word. He respects the democratic process. There’s transparency. Even though I’m a newcomer to Conservative ranks, I had an equal chance of winning the nomination,” he stated. The former chief organizer for the Liberal party of Canada in Laval-Les Îles, Mr. Evereklian believes the voters want change. According to him, voters support the candidate more than they support a particular party. If a candidate offers what the people are looking for, they’ll support him,” he stated in an interview the day after his nomination. Prior to a writ drop that is all but scheduled for February, does this indicate that the Conservative Party represents the viable vehicle for federalist votes in an upcoming election? With Mr. Dion’s leadership numbers lacking, and abysmal in his home province of Quebec, is the Quebecois political class reading the tea leaves in that province? There will be criticism of party hopping, but as a trend, this be the first signs of an even poorer showing in Quebec for the Liberal Party during the next election. Granted, Evereklian faces a tough fight in Laval-Les Îles, as the incumbent Raymonde Folco received 20,849 votes (39.3%) to the Bloc’s 17,537 votes (33.1%) in the last election. The Conservative candidate in the riding received 9,055 votes (17.1%). Despite this Evereklian can bank of one obvious advantage against Folco; he used to be a senior political advisor to the Liberal. Posted on December 6, 2007 Author Stephen TaylorCategories OtherTags agop t evereklian, conservative party, laval-les iles, Quebec, raymonde folco, stephane dionLeave a comment on Federalist tide in Quebec shifting Conservative? Karlheinz Schreiber claims that he paid former Prime Minister Brian Mulroney $300,000 to lobby his successor Kim Campbell and her government for the Bear Head Project. Schreiber never got his was as he must have been somewhat ignorant to evolving Tory fortunes. 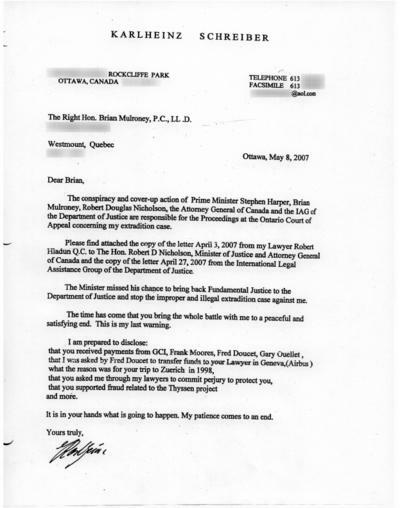 We later learned that Schreiber sought the services of Trudeau cabinet minister Marc Lalonde to lobby the Chretien government on the same project. Schreiber, it seems, has the unfortunate mindset that Mulroney is his only hope and by extension of MBM’s involvement, hopeful interference by Harper/Nicholson in the extradition process. I obtained a copy of the letter yesterday. Here it is. There are some privacy concerns surrounding the material that Schreiber disclosed in committee yesterday. As such, I’ve blurred private information, including Schreiber’s Rockcliffe address, phone, fax and email. I’ve also blurred out Mulroney’s address.